– The biggest surprise for me on this go-round were the number of strangers that are almost the “early adopters” of the campaign. Two of the first five contributors to Theoxenia were absolute strangers; people that found the page through just scouring different categories on the Kickstarter main page. These strangers also don’t pull their punches in the wallet, as between the two of them, almost donated the first $100. That’s inspiring. – The biggest thing for me on this campaign was wanting it to be organized, planned out, and something that hopefully gets people involved and interested. So, probably the biggest surprise was just how quickly that all goes out the window. I’ll admit, I didn’t spend as much time, thoroughly developing the campaign before setting it live. But, I had a calendar written out – which was thrown off just in that I pressed the “approval” button over the weekend. So, my anticipation to go live was thrown off because apparently (and rightfully, I guess) Kickstarter staff doesn’t work on the weekend. So, then when we were approved, it was technically later than I’d planned; which forced me to want to live immediately…unfortunately, I hadn’t finished preparing my other planned activities. – The last surprise, for me, is just in the response you get by individually contacting as many people in your circles as you can. So far, every contributor, except the two strangers and two others, we’ve gotten has come from me directly messaging people on Twitter, Facebook, and emailing. The other two people have been referred by other contributors. Granted the campaign isn’t over, so this could definitely change, but at least early in the process it’ll be down to the main person running the campaign to get the eyes on the project. 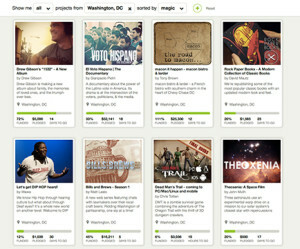 We’re listed in the top 8 Washington DC projects on Kickstarter’s homepage. – To go off the preparedness note above, I’d definitely want to execute things a lot earlier. Not necessarily to make everything flow smoother – because there’s bound to be surprises that will throw off anything you try to pre-plan – but to alleviate the stress that I’m currently going through in getting things done. I’d probably have images, videos, and text written for specific benchmarks and contests. But, I’m a firm believer in not automating thank you messages and approaching people to contribute. I think that kind of robotic-ness can put people off – or at least would me – and people are definitely more willing to help if they feel a connection. – This one is maybe more of something I’d set up to do, but didn’t. So, I’m not sure how well it would work, or whether it’d be weird and a waste of time – possibly even turning people off. But, that was an idea I had of sending people an email before even setting up the Kickstarter page. It would ask them if they would have any interest in contributing, possibly stating how much they’d be willing to give, and signing people up to be sort of the street team. There’s a part of me that thinks it could be a detriment, as a failure of responses to that could put you off even doing the Kickstarter. Whereas just winging it and only finding out if people would contribute after you’ve gone live, is invigorating. – I’m also up in the air as to whether I should’ve had more “test-footage” to show at the beginning. For this project, and at this time, it was just an impossibility for me. I know some films have the resources to film essentially teaser trailers, or even parts of the film. The teaser trailer that I did have – using a photo from NASA’s Hubble Telescope (which are public domain images, in case you didn’t know), and a song from the composer of my previous short film (Michael Bashur) – doesn’t show much of what the movie is meant to be. One friend commented that it looks like God is flipping us off… So, that’s fun. But, it’s something I’ve thought about. I wish I could have had my model ship, some actors, and sets already constructed to have some finished-like footage to show… Maybe next time. Finally, right now on the campaign I’ve put out the offer that anyone who contributes from now (Tuesday, April 8) until we hit 50% funded, will receive an original alien drawing from me. Check out the link: http://kck.st/1n04xN8 and the video below.